August 25, 2014 By Allyson Leave a Comment This post may contain affiliate links. Read my disclosure policy. 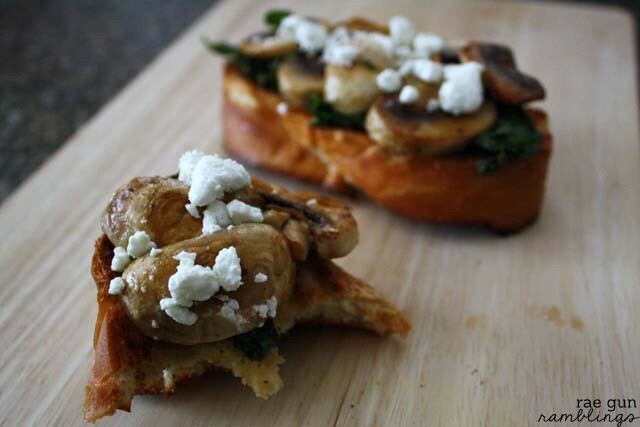 Today we have a delicious recipe from Marissa at Rae Gun Ramblings! 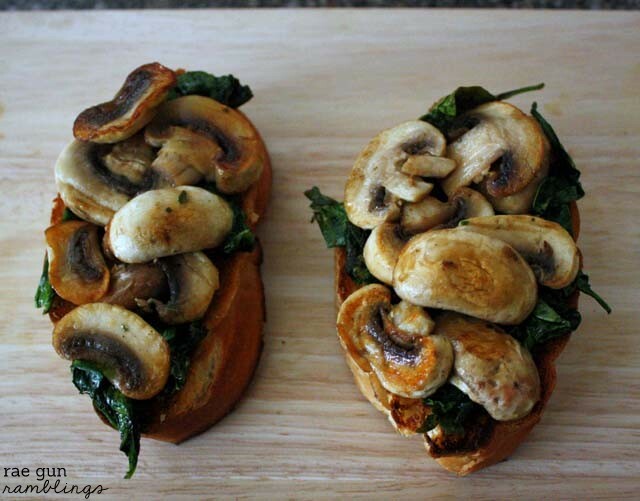 I can’t wait to make this one myself as I love mushrooms and spinach! Hi everyone I’m Marissa from Rae Gun Ramblings where I share my addition to crafts of all sorts, delicious foods, and wonderful reads. 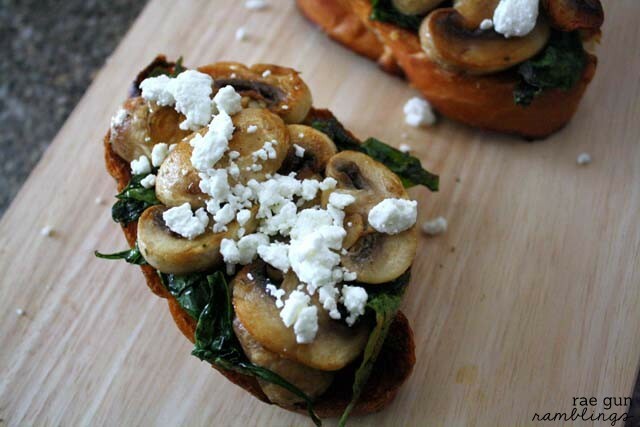 I’m so excited to be here sharing an easy recipe for spinach and mushroom bruschetta. I love this recipe because it’s something that you can throw together as an appetizer on small pieces of bread or do on a full sized loaf for a meal on it’s own. Not only is this dish speedy to put together but it’s absolutely delicious. With it’s simplicity it’s easy to make it vegan, vegetarian, or if you want to add some meat even more hearty. I’ve been known to make this for myself for a quick lunch. 1. Start by making some wilted spinach. Heat butter/alternative/or olive oil in a pan over medium heat. Add spinach and garlic salt, to taste, and mix with a spatula until wilted. This will only take a few minutes. *You only need a small amount of butter/oil. I've even used just spray oil. Set aside. 3. Next make garlic bread. I know other people take time using fresh garlic or rubbing garlic on the bread but my favorite garlic bread that is always a hit with my guest is just buttered bread sprinkled with garlic salt and cooked under the broiler. 4. 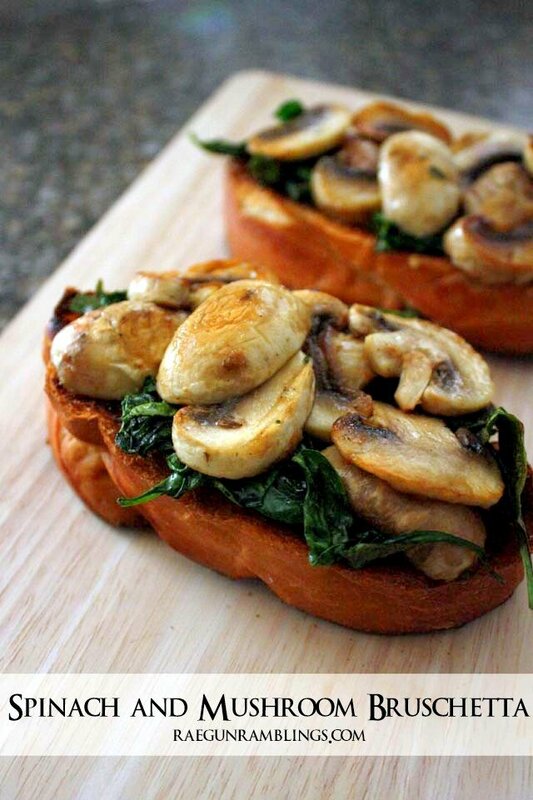 Top the garlic bread with a generous layer of spinach and then with mushrooms. 5. Add a sprinkle of crumbled goat cheese if desired and enjoy! I hope you give these non-traditional bruschetta a try and swing by my blog Rae Gun Ramblings to say hi! Marissa’s a huge Harry Potter fan, lover of fried food, Instagram addict, and new mama to five month old Teddy. She spends her days sewing baby clothes for her shop Rae Gun and blogs over at Rae Gun Ramblings where she loves to share her favorite recipes, creative tutorials, and book recommendations. Here are a few of her favorite posts for Summer. Stop by her blog to see more and say hi!